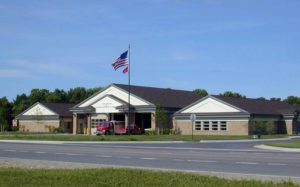 Oakland Township Headquarters Fire Station – Sidock Group Inc.
New Satellite Fire Station designed to meet the future demands of an upscale community. The Station has four drive-thru apparatus bays with necessary support spaces. On one side of the central apparatus bay is the “active” area watch room, Captain’s office, and large training room, which is also used for Community activities, with controlled access for after hours use. On the “passive” side are the living quarters including kitchen, day room, locker rooms, and sleeping quarters. Due to its remote location, the Station was designed with a well water system and storage tank capable of handling the fire protection systems in the Station. Future plans include a multi story training tower with draft tank for Department training.